Black Covert at Ystwyth Forest (NRW)0300 065 3000work Picnic SiteBlack Covert is a peaceful spot by the River Ystwyth which flows through this steep sided valley on its way to Aberystwyth. The picnic site here shelters under large Ash, Birch and Sweet chestnut trees with the beautiful Afon Ystwyth rushing by. You can either do the gentle riverside walk or try the more strenuous Birchgrove/Coed Alltfedw walk. Riverside Walk (1.75 miles, 2 kilometres). 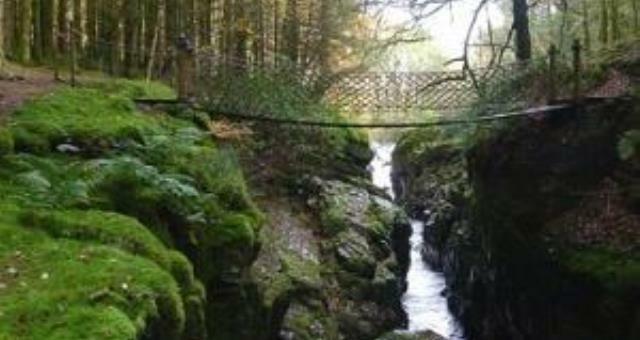 This trail offers a gentle walk from the picnic site and alongside the River Ystwyth returning through woodland filled with the scent of resin. Birchgrove Walk (2 miles, 3.2 kilometres). This trail includes numerous long climbs and steep descents as it passes an attractive pond and the 2000 year old hill fort of Allt-Fedw. There is a viewpoint with panoramic views over rolling hills and valleys. Located off the B4340 from Aberystwyth to Trawsgoed. 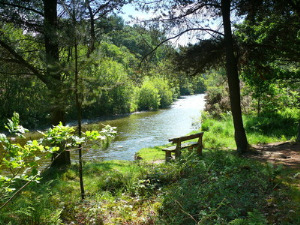 Black Covert picnic site is 1 kilometre south of Abermagwr. Turn right over the bridge (signed Llanilar B4575) then turn immediately left and left again into the car park. Black Covert is a peaceful spot by the River Ystwyth which flows through this steep sided valley on its way to Aberystwyth.